Coming up with ideas has always been easy for me. Remembering to write them down, however, used to be a problem. Everywhere I looked I saw opportunities for writing – an unusual phrase, a quirky look, headlines that took my breath away, a comedic twist on a serious issue, or a serious spin on a comical event. Everything became fodder for articles, blogs, books, screenplays, and more. But, as is sometimes a problem for me, I get in the way of myself. Having been classified as a scatterbrain by more than one person, my amazing ideas would get scribbled into corners of envelopes that sometimes mistakenly got thrown away. If the only thing available to write on was the torn edge of a magazine, I used it. And a child ate it. But a fierce wind would blow them away, and I would lose them. Over the years, I learned to invest in tiny spiral notebooks where I recorded my thoughts and insights. I even placed my Post-Its in them. Eventually I amassed a trunk full of ideas. Because he shared his idea-keeping skills with me, I became more organized with my ideas. And now (long overdue) I would like to thank Kenny for helping me organize my ideas. So, my treasured friend, thank you! If you google Kenny Haas, you will note that he was the script writer for the Disney's Aladdin Look and Find book. Very creative. Until Kenny told me, I never realized that Look and Find books required writers. 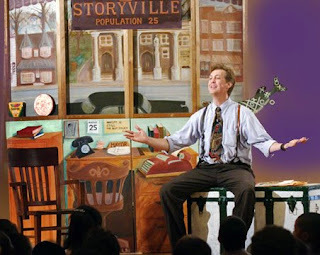 The photo above shows Kenny entertaining children with his stories. "Paper remembers...people forget." It is amazing how the seed of a story can bloom later when you've got a place to jot it down. I'm a scatterbrain myself. I make lists and then lose them! Thanks for the great ideas.